For many young adults, entering the workforce can be jarring. Throughout your life, you’ve been told the importance of becoming a well-rounded individual. So you tried different activities, studied various subjects, and developed a wide variety of interests. Then you have to pick a career path. Suddenly, it feels like you need to pick between your love of technology or art; politics or cooking. You have to decide what will be your career and what will be demoted to a weekend hobby. There will be tough decisions. Some interests will have to take priority over others. But if you’re smart in your choices, it is possible to find a flexible career path that doesn’t confine you to a suffocating box. You just have to take some time to explore all of the options open to you. A Gallup survey found that among employees who had been with their company for more than three months, 60 percent stayed because their job allowed them to do what they do best. That factor had an even bigger impact on employees’ satisfaction than having an increased income. Why is that? It’s simple—people are happier when they get to go into work every day and do what they were meant to do. The trick is figuring out what your calling is. The first step in that process is thinking about what makes a dull task more bearable for you. For example, imagine that you had to spend an entire day cleaning: Would it seem less odious if you could work with a team? Or if you had to solve riddles to correctly identify the cleaning products you needed? Your answer to these questions will help you get to the core of what you need out of a career. To dig deeper into what motivates you, consider taking online personality assessments or using career exploration apps. You might be surprised by what they reveal about you and how they help you narrow down your options. Your education does make it easier—or more difficult—to get certain types of jobs, but it doesn’t completely limit the industries you have to work in. If you majored in biology, you’re not restricted to just medical or scientific fields. If you’ve taken classes in computer programming, that doesn’t mean you have to get a job in the tech industry. Many of your skills are transferable from one industry to another. A Burning Glass study found that research skills were ranked in the top 10 most important skills for various industries, ranging from marketing and PR to healthcare and IT. Look into a variety of industries and find out which skills are most important in them. Think outside the box and consider what your unique experience can bring to an industry. For example, say you’ve always loved music, but are tone deaf. Instead of learning the guitar, you studied web design. You can always embrace your interest in music and use your skills by designing websites for bands or record labels. Whatever career you choose, chances are its responsibilities and duties won’t satisfy each and every one of your interests. That’s just the way of the world. But that doesn’t mean you need to be locked away, never interacting with people from other departments ever again. 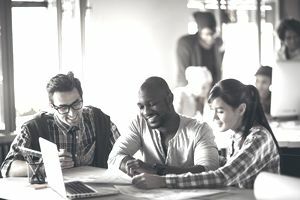 An organization that encourages cross-departmental projects and collaboration can enable you to be exposed to other things, even if they’re not part of your job. If your job is in sales, for instance, you can work with members of the design and marketing teams while creating literature on your products. Or with programmers to create a new purchasing page for the website. Truly collaborative organizations offer you fluidity in your role. Of course, you’ll still have your designated duties, but you should have opportunities to engage in a range of related activities as well. When considering which company you’d like to work for, reach out to current employees and ask them how teamwork is actually practiced in the office. Find out how cross-departmental projects are structured to see how involved an employee can be with different aspects of the process. As someone who is interested in many different things, chances are you won’t be satisfied unless you can continually experience new things and learn new skills. That means you’ll need an organization that supports career development. And just because a job seems like a great fit right now, that doesn’t mean it will continue to fit in the future. What will make the difference in your long-term happiness is how well the organization supports your curiosity. When researching employment opportunities, find out how a company approaches training and development. Do they put all employees through the same generic training and rote distribution of responsibilities? Or do they allow employees to choose what they learn and explore skills and duties not directly related to their current position? If you don’t feel like you’ll have the chance to continue exploring different interests, chances are it’s not the right place for you. Being a well-rounded person is never a bad thing. But it can make it difficult to define the right career path. As long as you take the time to look at all your options, you’ll see that you can find a career that satisfies your desire for multi-dimensional work, instead of pigeonholing you into one role for your entire career. Alex Li is a co-founder of PathSource––a comprehensive online career exploration tool that allows users to discover informational interviews on video about a wide range of jobs and career paths.